Home / Public Protection / Media / News / The doors are open for the College’s 20th anniversary! The doors are open for the College’s 20th anniversary! The College is celebrating 20 years of regulatory excellence by inviting you to visit us as part of the 18th annual Doors Open Toronto event! 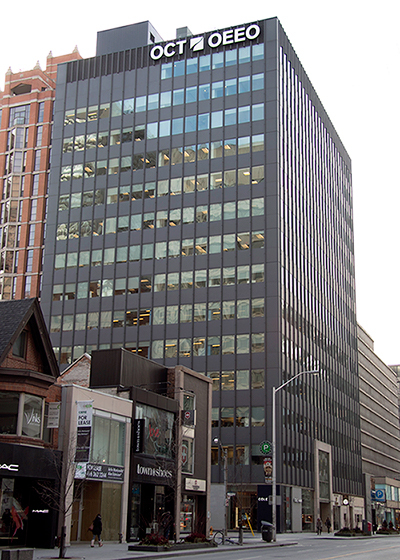 From May 27-28, we will be hosting guided tours of our building at 101 Bloor Street West. You’ll be able to learn more about who we are, what we do and how we set the standard for great teaching. Doors Open provides free and rare public access to 150 of Toronto’s most architecturally, historically, culturally and socially significant buildings. To learn more, click here. The TTC subway will be closed from St. George to Broadview station during Doors Open (May 27-28). Plan your trip to the College accordingly. Did you know that 101 Bloor Street West took 10 years to build, was designed by architect John H. Daniels and was built in the Post-Modern design?